Today we have a guest post from the lovely, Autism Mumma. Do read her blog, its an inspirational story of her journey with her daughter, D, who was diagnosed with autism before she was five years old. She is passionate about raising awareness of autism; as she herself calls it the “invisible disability.” Today she shares with us some of her experiences in using PECS with her daughter. It took a further year and two attempts to get her a Statement of Special Educational Needs (SEN) and during that time she had a 1:1 teacher for 25 hours per week – basically the whole school day excluding break times & lunchtimes. 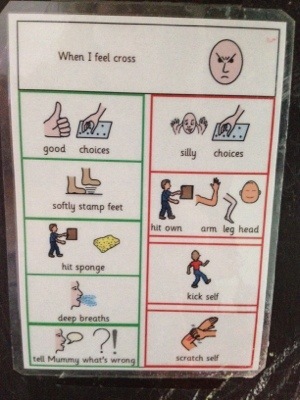 For those not aware of PECS, this is a form of alternative communication that uses pictures instead of words to help children communicate. For example, there could be a set of pictures with a child’s favourite items on (train, apple, drink etc) when the child wants an item, the child gives his/her care provider the relevant card and is then handed the item. This exchange reinforces communication. It can also be used to comment on things seen or heard in the environment – for example, an airplane flying overhead, and the card is then used – in children who are able to verbalise, the word could also be used as the card is passed from care provider to child. 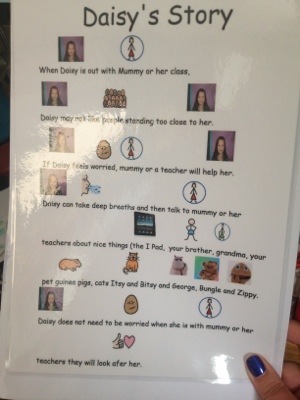 In D’s case, she is verbal but her speech can become stilted with anxiety or during a meltdown and I use PECS symbols/charts to try and bring her back from her anxious place and to move forward from a situation. The primary aim of the one above is to prevent her from self-harming, we have quite a few of those dotted around the house! We also have PECS symbols and a Velcro board which detail the evening routine but I don’t find these as effective with D as she is always fascinated by the little cut outs and ends up loosing them under her bed. Charts, attached to the wall, with symbols on, are a much better solution for us. When she was younger we did try star charts, but the appeal of stickers that could be removed was too big for her. Having the flexibility of something to colour in, as with KiddyCharts, might have been better as it would simply have removed that particular temptation! One walk of D’s classroom in her SN school is covered with PECS charts detailing the day/week/month, the weather, the timetable, the names of the children and the red/orange/green behaviour chart. 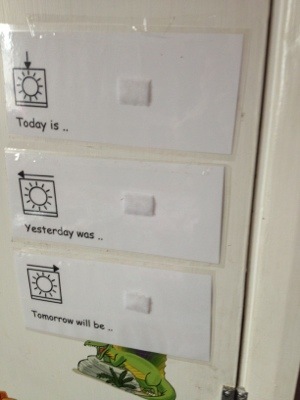 It’s a very visual, positive reinforcement for the children as to the order of the day. Thanks for posting this. Having a friend with autism, I know how hard to be around them. You have to have patience and clear mind. Our son is non-verbal. The pecs system has been the first real break through with communications with him at school. We’ve been trying to use the bathroom pecs at home to get him potty trained. Still working on it. Win an amazing wooden train bundle your kids will adore from Hape!